Small Unmanned Aerial System (sUAS) or Drone technology is relatively new to the common man and it was unheard of until 2012. Before that, it was mostly in the hobby circles and R&D labs of universities or military establishments. Please bear in mind that this blogpost (as well as Thanos Technologies) focuses mostly on sUAS or Small Unmanned Aerial Systems only and not the military drones you hear about in the news or read online. Let’s go ahead. Everytime an exciting new technology becomes affordable and accessible, people try to create new and crazy things using that technology. Some of these applications become mainstream, some are restricted to closed circles and some become obsolete. Same is the case with drone technology too. It will take some time to understand the applications that go obsolete since we are just starting. Now, if you’ve checked our FAQs section, you will see a list of applications that people have tried building. Allow us to save you time and mention them here again. There might be some applications here you never heard of. There might be other applications out there that we never heard of either. There are these drones from QUADH2O that fly in the air as well as sit on water like a boat and take underwater footage using a waterproof camera attached at the bottom. And then there’s this drone from Rutgers University that goes completely under water and can even move under water. Check out the video below to see it in action. While we are on that, there’s products like SkyWall 100 and DroneShield that are essentially drone defense systems i.e. systems that would bring a rogue or illegal drone down. The need for such systems comes out of the proliferation of drone usage in the past few years and the careless usage of drones by a few individuals. Having said that, the regulations also haven’t been able to match the speed of this technology during the initial stages. In the recent past though, quite a few countries have come up with sUAS/UAV/Drone regulations and have opened up opportunities for Commercial and Non-Commercial usage of drones in a much more sensible manner. Today, drones are being used for Surveying, Precision Agriculture, Project Monitoring and many more commercial applications. Drone Delivery is a popular idea and a few people have already tried it. Amazon has its own prototype and successfully tested it. So has Dominoes. Another Indian pizza company based out of Mumbai tested drone based pizza delivery successfully. Most logistics companies would be willing to tap into this aerial delivery system since it allows them to complete delivery in a very short duration thus allowing the logistics companies to give more guarantees to the customer as well as do more business. However, there needs to be a proper system in place before such activities can be taken up in urban setups so as to avoid head-on collisions or to avoid flying over restricted areas. Let’s head to a slightly different subset of drones – manned drones. These can’t be called sUAS or UAV because they are not UNMANNED. This is a bit futuristic since there is no system in place currently that allows drones to talk to each other or to a central Traffic Control system. Such a system is being worked on as part of the NASA’s UTM plan. We have been hearing about Flying Cars for a few years now and there’s quite a few prototypes from Terrafugia, Aeromobil and other such companies. There’s also a manned drone from a Chinese company Ehang. It looks more like a quadcopter, has 8 propellers (coaxial pairs) and can fit one person inside. It’s called the Ehang 184 and the prototype testing is already on. Flying Cars and Manned Drones are not the stuff of science fiction anymore. The future (the next 5-10 years) is when we could see Drone Delivery and Manned Drones (or flying cars) become a reality. That’s our expectation anyway. A few network service providers are already planning to launch mobile network service for drones provided such a technology is embedded into drones. This could be one of the early steps in allowing drones in flight to interact with external systems (Traffic Control systems or other drones) in 1-way or 2-way communication mode. And Ehang announced that it will be testing its manned drone over urban areas to show everyone that it is the safest drone for manned flight. That’s pretty exciting. FPV racing (Drone Racing) has taken off in the last 2 years and has gone mainstream. ESPN plans to telecast Drone Racing competitions on similar lines to F1 racing or Soccer. 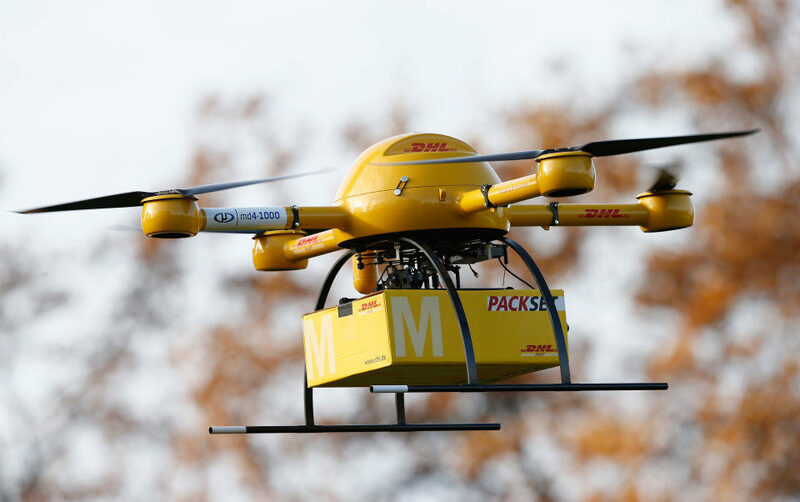 Here’s a picture of a DHL Delivery Drone. We are living in pretty interesting times as far as this aerial technology is concerned. Everyday, somebody somewhere is thinking of new applications for drones and is working with utmost dedication to bring his/her idea to reality. We will keep you updated as and when we hear about things like that. ⟵What is Thanos Technologies and why was it started?